A four floor Primark on Church Street gathers huge crowds rushing in and out of its doors. A huge McDonalds commands the view on the edge of Lord Street. A Caffe Nero, Starbucks and Costa Coffee are permanent fixtures in every corner of the city. A quick walk through Liverpool is all it takes to see that plenty of big-name businesses have made their home here, attracting people by the thousands. For some, it can be fatiguing to encounter the same places over and over, especially when it feels as though there’s more Tesco stores than people. Enter Independent Liverpool, a website started by best mates David Williams and Oliver Press. The site documents around a hundred of the city’s local businesses in loving detail, projecting a snapshot of the variety on offer. From Maya (a bar channelling Mexico’s Day of the Dead) to the Camp and Furnace (a multi-purpose venue inside a disused warehouse), the coverage of Liverpool’s local scene is fascinating. 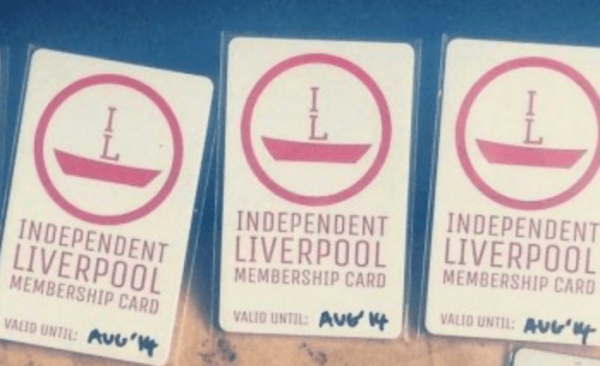 Add in a membership card providing discounts for these places, as well as a regular blog discussing the lifestyle within the city, and it’s clear to see that Independent Liverpool is a celebration of culture above all else. TSOTA caught up with David and Oliver, who collaborated on their answers discussing how Independent Liverpool developed, what advice they would give to new businesses, and their predictions for the city’s future. TSOTA: How was the idea for Independent Liverpool formed? IL: Independent Liverpool was started by ourselves, David Williams and Oliver Press. We’ve been best mates since we were four and we’ve always had little business ideas and schemes going. The majority of them were awful, but this one seemed to stick. After walking round our local area we noticed the lesser known independents that are busting with character were being overran by big chains, and we wanted to tell their story in the hope people would discover different. We started a really crappy looking blog, asked our friends and family to like our Facebook page and we kept at it. The card only became an idea 6 months after. TSOTA: In 2008, Liverpool became the only location in England to be named a European Capital of Culture. What do you believe defines Liverpool as a city of culture, and do you feel its local scene contributes heavily to this? IL: Liverpool is different to most cities. We know we’re heavily biased but it really is, from the locals to the humour and from the food and drink scene to the vibe. Scousers are endowed with civic pride and it’s full of risk takers. We feel the local scene is where the character and the heartbeat of any city is, so we feel the local scene has contributed heavily and has improved leaps and bounds since 2008. TSOTA: One of the biggest factors that your group has to offer are the discounts and bonuses at around 100 businesses around the city. Do you find yourselves approaching businesses about working with Independent Liverpool or do companies approach you? IL: It is definitely a mix of both. Our job is to know the good places so they’re always under our radar, but obviously Liverpool is a huge city and there’s only two of us so we haven’t discovered everywhere. It is a great feeling that people feel we can help them and we try anyway we can. TSOTA: Alongside the many offers your membership card provides, how do you entice people towards visiting independent businesses in the city? IL: As well as discounts, we’re well aware the pen is mightier than the sword. Our blogging, words, content, whatever you want to call it, is an integral part of our whole business. Rather than simply become a robotic service that serves to tell people what discounts they can get with the card, we tell people in fun and intriguing ways that doesn’t exclude non-cardholders. From our alternative bucket lists to lists of things to do when you’re addicted to cheese, our website has attracted close to 10 million hits since we started and our blog has worked wonders in enticing people. It’s all about the food pictures, they do it alone. TSOTA: Students are a large part of Liverpool’s population, especially within the city centre. Do you feel it’s important to target this demographic, especially when persuading them to shop locally? IL: A hundred per cent. Close to 60k students come each year, armed with student loans and they can have an incredible effect on our local economy. We believe deep down that for any student to truly experience the real Liverpool, they need to tour the city through independents. They can get a Starbucks or a Nandos at home but they can’t have a Bold Street Coffee, for example, anywhere else. We want to instill that sense of experience and exploration in everyone, from locals to tourists. TSOTA: The Baltic Triangle has become well-known for developing into a creative hub for new industries. What factors do you think have led to this reputation? IL: A lot of factors. Hard work, most importantly. The guys behind Baltic Creative, who at the end of the day are just glorified property owners, have managed to capture and harness the digital potential of a city and control the chaos. The rent is cheap and the osmosis of fellow creatives has created a perfect environment for business to flourish. Baltic Creative have been amazing but obviously we needed the risk takers, illustrators, game developers in the first place. They’re both as important to each other’s success. The conditions have allowed creatives to flourish and there’s some pretty good coffee shops too, and we all know nobody can be creative without a coffee. TSOTA: Another notable area for such creative and local companies is Bold Street, a place which has developed quite rapidly – in April, you highlighted how a new business had opened every month for 24 months, as well as a low vacancy rate and an increase in visitors. Why do you believe the area has grown so quickly? IL: Bold Street has always been so well known for its independent scene but we believe it has had a domino effect. As one person takes the risk and reaps the award it is only going to encourage more to. Bold Street is the one street in Liverpool where you can eat all over the world in one stretch and manages to represent Liverpool’s past, its present and shows the potential for the future. TSOTA: What advice would you give to new smaller businesses planning to open within Liverpool? IL: Go for it. Live your dream. Don’t be that person at 70 years old who wishes they’d taken that risk. Yeah, it might go wrong, but what if it doesn’t, what if it goes right? We’re lucky to be in a city where people like to see their fellow people do well and take risks. Go for it and hopefully we can help you along the way. Liverpool is full of people who’ll take the time to give you advice, use them. TSOTA: Independent Liverpool not only provides its audience with new places to visit and great discounts, but also reports on Liverpool-related events and posts lifestyle articles. Do you feel that the people of Liverpool have specific lifestyles and interests, or do you believe that these articles are more about crafting such a lifestyle? IL: Liverpool people know what they like. Believe us, we’re a stubborn bunch. The independent mindset has been one that has been around decades before we were even born. There has always been a collective living this lifestyle, our service just makes it seem a lot easier and a lot more enticing to the average individual. We also give the people who already live the lifestyle a different option of what to do or to let them know about a new place they haven’t heard of. Essentially, we’re chronicling independent culture and just making it easier to find hidden gems that might be out the corner of your eye but definitely deserve a place in your heart. TSOTA: Your website doesn’t just follow what happens in Liverpool, but also related events outside of the city. For instance, you recently reported on Andrew Rogerson, a man biking from Shanghai to Liverpool for charity. Do you believe that for the residents of Liverpool, there is a great amount of interest and pride in what its people are doing not just locally, but globally? IL: Definitely. Scousers are in every corner of the world (we’re half convinced we’re colonising the globe) and they always manage to make a name for themselves wherever they go. Good or bad is up for debate! [laughs] Andrew is a special individual that encapsulates that Liverpool spirit and we’re honoured we can document his journey. TSOTA: How do you believe Independent Liverpool has managed to place itself at the very heart of the city’s independent scene? IL: You know, deep down, for both of us, Independent Liverpool is still that crappy looking blog we started in January 2013. We’re so involved we’ve never been able to take a step back and look at our achievements, our accolades or our dedicated following. This, weirdly, has been integral to our success. We never developed egos, we never stopped caring and our passion never died. We’re just truly honoured and slightly bemused so many people use us to live their lives and we can only work harder than ever to convince more to do the same. Without the amazing independents we’d have nothing to document so we thank them for everything. TSOTA: How do you see Liverpool growing within the next 5 years? IL: In the next 5 years we see Liverpool being used in the same breath as London. We’re growingly rapidly and we just want to make sure it’s sustainable. That there is enough people able to support, enough chefs, enough innovators to keep up with the renaissance. We think Liverpool is basically a walkable London and will become one of the most popular places to live in the coming years. Our food and drink scene will only improve (sorry, waistline and wallet) and our community will get stronger. Archaic stereotypes of Liverpool are shattering to the ground and in the next 5 years it is up to us to show the world what we’re made of.